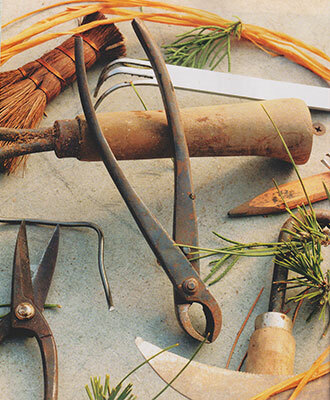 Just as in any profession, there is “the right tool for the right job.” The very basic bonsai needs could range from just a simple pair of scissors to a whole tool kit, including a variety of wire, but you will also want to consider more specialized tools: shears, concave cutters, wire cutters, and root rakes. Bonsai West carries high quality tools from Japan, famous for their centuries-old forging techniques. We’re happy to teach you about the different tools and their specific functions. Accessories to this hobby include different gauges of wire, soils, grow lights, turn tables, humidity trays, and fertilizers. We’re very proud of our soils! Bonsai soils can range from our well formulated all-purpose mix to imported Japanese mixtures, and to freer-draining custom mixtures. At Bonsai West we think of ourselves as bonsai farmers and try to teach and practice the most logical and simple tried-and-true methods for successful horticulture. As you get to know us you will see that that we love growing bonsai and that is the only secret recipe we have.